Rent Polycom Video Conferencing systems to support your meetings. Allowing your attendees and delegates to understand as well as participate in the proceedings allows you to further the goals and educational objectives of your event. We are one of the premier suppliers of simultaneous interpretation equipment and services, we have one of the largest inventories of equipment worldwide and we offer you the highest quality equipment available. Our systems are portable and feature wireless infrared receivers or radio frequency receivers for indoor and outdoor use. Infrared interpretation equipment: the more widely used of the simultaneous interpretation systems, our IR system is capable of providing up to 16 channels simultaneously. Infrared technology is ideal for board meetings and private conferences where security of content is necessary. Radio frequency equipment: quick to set and because the transmitter uses a radio frequency, a much larger area can be covered. 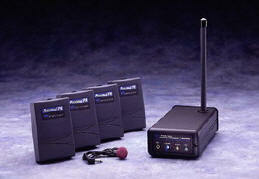 Radio frequency equipment is suitable for use in large meeting venues such as exhibit halls and arenas. Click on any word or text to translate it. Download Babylon 6 for FREE now!! The T17 transmits in 10 Wide-Band channels! The T17 features an audio indicator, audio level adjust, and will accept an unbalanced line-level input or a Williams Sound condenser microphone. The T17 Transmitter and R7 Receivers are field-tunable to 10 wideband channels. The T17 connects to the existing sound system or can be used with its own mic (not included). Listeners use R7 receivers to hear clearly and easily from anywhere in the seating area. A remote antenna (ANT 005) and rack mount kit (RPK 004) are also available. The T17 accepts virtually any balanced or unbalanced input, while top audio quality is assured by low noise circuitry and a sophisticated audio processor and headset (Comfortable dual headphones have an adjustable headband. Foam cushions can be washed or replaced. 3.5mm plug, 1m cord. Recommended for FM Receivers, Select IR Receivers,). ¿Cuál es la función de los equipos de traducción simultánea? El equipo de interpretación simultánea es un sistema de transmisión cerrado que envía una señal de FM (frecuencia entre 72 y 76 MHz) para un número indefinido de receptores personales en manos de la audiencia. Cada participante recibe por su su / su uso durante la conferencia, un receptor pequeño y ligero con control de volumen independiente para escuchar la interpretación simultánea mientras se sienta libremente en el área de su su / opción o moverse alrededor de la habitación y las zonas adyacentes de hasta 400 pies de distancia del transmisor (transmisión libre de obstáculos). Este sistema es como una pequeña estación de radio. Los intérpretes suelen utilizar auriculares con control de volumen independiente para escuchar al orador o la persona que utiliza el micrófono en cualquier momento (a veces, y con sujeción a la decisión del líder del evento, los intérpretes pueden trabajar sin auriculares) y de inmediato interpretar el mensaje con la asistencia de micrófonos o auriculares. El equipo de traducción se ofrece como un alquiler durante para su evento y hay que pagar una cantidad específica por cada unidad necesaria en función del número de asistentes a su evento. El transmisor se utiliza para cada idioma y el auricular receptor / por participante. El equipo de traducción está disponible como de sobremesa o portátil (equipaje de mano) unidades. Conferencias y reuniones formales normalmente utiliza el equipo de sobremesa, mientras que los tours y excursiones requieren la versión portable. Para conocer el precio, si usted necesita el equipo audiovisual incluye una solicitud de cotización. RF systems provide the simplest and least expensive solution to language interpretation. Easy to use, flexible and versatile RF systems are the most popular interpretation systems on the market. The systems available are applied in business and government meetings, international conferences, bilingual workshops, site tours, training seminars, houses of worship and courthouses - everywhere language interpretation services are needed. Our expert staff will help determine your specific application and custom build a system that is right for you, and your budgetary plan. Call our offices for a turn-key solution available from 1-6 language systems. Polycom Video Conferencing systems to support your meetings. Now rent Polycom Video Conferencing systems to support your meetings. Our technical support staff can setup and operate the system to ensure your meeting is a success. Video Conferencing is the fastest, most effective means of electronic communication available. As broadband, ISDN and DSL telecommunications emerges in the Business 2 Business market place, Video Conferencing is the best and least expensive to have meetings around the world., Conferencing can now be communicated at up to 30 Frames Per Second, giving ‘near TV’ picture quality. Real time data sharing can also be communicated during a conference, with up to 4 sites involved in a meeting. Polycom units are compatible with nearly all Video Conferencing systems. Installation and usage of the units are now simply ‘Plug ‘n Play’. Reduce your Travel Costs, Overnight Expenses and downtime while your people are in transit and choose Video Conferencing as a faster more efficient means of arranging important meetings. 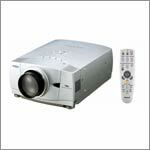 The ViewStation FX set top video system provides TV-quality video for the most demanding video communications needs. Embedded streaming capabilities let you capture and send meetings, presentations or broadcasts to anyone equipped with a Web browser. Polycom's unmatched full duplex sound and tracking technology make video meetings effortless, natural, and push-button-easy. Audio flexibility and custom application support are extensive. Video Quality ViewStation has a tremendous amount of power. Polycom uses that power in two ways for video. At high bandwidths (512 kbps up to 1.922Mbps), it delivers TV quality, 60 fields video, for an outstanding video image and complete motion capture! The secret is capturing both fields, which comprise a frame. (For NTSC, there are 30 frames per second). By capturing both fields, the resolution is greatly heightened and the motion is captured much more accurately. The resulting image is amazingly brilliant. The second benefit of the increased horsepower is the increased utilization of ITU defined Annexes that are the compression tips and tricks used to optimize the limited bandwidth for delivering the best possible picture possible. At Polycom, we emphasize picture quality above all other aspects of video. We also realize the importance of smooth motion handling. Because we are not willing to comprise on either, we cannot sacrifice the overall quality of the picture to deliver 30 frames per second at lower bandwidths than 336 kbps. The audio performance of a video communication is critical to the user's perception of a good videoconference. If the audio signal breaks up, or becomes out of sync with the speaker's lips, the videoconference is not contributing to clarity of communication. Polycom supports numerous algorithms ranging in capability from G.711, (low bandwidth (7 kHz) and high bit rate (48, 56, 64 kbps)), to G.722, (high bandwidth (7 kHz) and high bit rate (48, 56, 64). The ability to automatically adjust the quality of audio is important when supporting low bandwidth calls. When more bandwidth is available, the codec wants to use more bandwidth to get better audio. Streaming is the process of sending audio and video over a local area network (LAN) from one source to many viewers. You can use streaming to conduct live broadcasts of meetings or events. For example, employees can view a live speech from your company's CEO. The ViewStation FX and VS4000 allow on-the-fly streaming capability! It's as easy to turn on as placing an audio call while in a videoconference. 42 Inch NEC With 1024 x 768 XGA resolution, Advanced AccuBlend Technology and a 3-2 pull down converter ensure the best possible brightness, contrast, color and image quality from any source. Realistic color reproduction via NEC's exclusive Capsulated Color Filter Technology is now enhanced by AccuCrimson, a filtration technology that produces the purest shade of red yet possible in a plasma display. VGA to UXGA in both 16:9 and 4:3 aspect ratios Dimensions 40.1"x 24"x3.5"
multi-language events, and Listening Assistance for the Hearing Impaired.